No hard or soft sell on the book today, y’all. If’n you wanna buy it (and you should), the button is over there on the right, or below this post if you’re on a mobile device. Today is World Cancer Day, and I urge everyone to get out there and do something either against this disease or for the victims and their families. Even if it’s just learning about what cancer is and isn’t and educating your friends and family, that’s at least something. And if you can do more, do it! If you have cash to do so, donate to a credible cancer charity to help fund research into prevention and treatment. Donate to a hospital or treatment facility. Even if you are cash-strapped, however, you can still do something. Give of your time. Visit a ward Got a neighbor, co-worker, friend, or family member facing treatment or in recovery? Make them a meal, bring them a coffee, give them some flowers, or a card, or a letter, whatever, but let them know that they are in your thoughts in some tangible way. I’ve got absolutely zero scientific, double-blind-with-control-group-and-multiple-corroborating-runs evidence, but I’m firmly of the opinion that mental and emotional health are key to beating this scourge down. I admit I never really gave cancer much thought before. It was out there and it was terrible, but it didn’t register on me high enough to warrant much more than a Like on a post opposing its devastation. My family didn’t really have any victims, so all my REAL empathy and focus was on things like diabetes and Alzheimer’s Disease. My wife’s family, on the other hand, had a long and tragic history with various forms of cancer. Bringing her into my life expanded the degree to which I cared, but it still didn’t TRULY register. 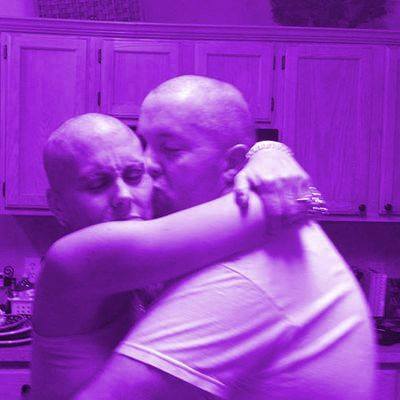 Then Jen was diagnosed with breast cancer. Suddenly, it loomed large and I felt no small amount of guilt that I had never done anything myself to oppose it in the past or to help those struck down. My wife is brave and beautiful. Today she’s also bald and in the midst of reconstruction, chemotherapy, and radiation. Today is, in fact, her second chemo appointment and I’m stuck at work rather than at her side as I should be. I’ll be trying to figure out how to make that up later. My darling Jen is doing something now. She’s very openly blogging about it on her Facebook page Jen’s Journey of Hope. She’s also been making little decorative dry-rice bags, for microwaving or heating, to use as heating pads and cold compresses for relieving muscle pain associated with surgery and treatment. At her second appointment today, she’ll be giving them away to the other patients, and she plans to do more. What am I doing? Well, I try to help Jen as much as I can (without making her feel wrapped in cotton or like an invalid — that woman is PROUD), and I’ll also be donating part of my pay each month to a group of research charities. Is it enough? No. I NEED to donate some of my time and services as well (I’m a fair carpenter), so I’ll see what I can fit in along with the honey-do list I’m perpetually behind in. What can you do? What WILL you do? Don’t let the question lie fallow. Answer it today!